With the right file compression software, sharing and archiving files is easy. The ever-growing size of hard drives means the need to reduce file sizes when storing data has been reduced, but SDDs still cost significantly more per gigabyte than traditional spinning hard drives, so compressing files can still be very useful. Compression is also very helpful when you want to send several files via email and keep them within the attachment size limit, share them via a service like WeTransfer, or send them to a remote cloud server. That's not all – in addition to reducing file sizes, compression software offers plenty of extra features to take into consideration. Perhaps the best feature of compression tools is the ability to encrypt files and protect them with a password – something you'll find in all the tools we've picked here. The most commonly used compression format is ZIP, but there are various other available. You never know which type you may encounter when downloading and sharing files, so it makes sense to have a program on hand that can handle more than one type. Here we take a look at a selection of the best tools, taking into account ones that offer the highest compression rates, and those that support the largest number of file types. It might not be the first name that comes to mind when you think of file compression software, but Hamster Zip Archiver has a very healthy following thanks to its thoughtfully designed interface, excellent format support, and because it offers all this for free. What makes this program interesting is its incredible ease of use. Even someone who is unfamiliar with the idea of file compression and decompression should find it easy to achieve the results they want. Creating and extracting archives to one of a range of formats is reduced to a simple drag and drop process, and there's cloud support as a handy extra. What this means is that you can, in one quick and easy operation, create a compressed file, upload it to Dropbox, OneDrive, Google Drive or Yandex Disk and have a shareable link created automatically. If you're compressing files to share them, this is a brilliant option. If you're not a fan of the drag-and-drop interface, you can use the Windows context menu to take care of everything – the choice is yours. One of the most famous names in the world of software utilities, WinZip is still going strong. Hearing the name feels like something of a blast from the past, and you may be astonished to learn that this venerable file compression software has reached version 21. At £31.14, US$35.94, AU$47.94 for the standard version, you may wonder if you can justify spending money on a compression tool when there are so many free alternatives available. Ultimately it depends on your priorities, but you do get a lot of extras for your money. In addition to support for a wide range of archive formats (including ZIP, ZIPX, RAR (extraction only), 7z, TAR, GZIP, VHD and XZ), WinZip offers integration with a number of programs including Office for easy zipping as you work. Other bonus features include the splitting of large zip files to fit different media, advanced file sharing options, cloud support and an advanced zip management system that rivals Windows Explorer. The interface adapts to suit mouse and keyboard setups or touchscreen devices, and there are backup and security options thrown in to protect your files. WinZip is an incredibly useful tool to have in your software arsenal, and it's flexible enough to work in the way that suits you best – you can create and extract via the program interface, or using the program window. As famous as WinZip in certain circles, WinRAR created a name for itself thanks to its proprietary RAR format, which offers incredible levels of compression. Most compression programs can extract RAR archives, but only WinRAR can (officially) create them. This exclusivity comes at a price – £35.90, US$46.54, AU$58.45 to be precise. Of course, WinRAR can be used to compress files into many other compressed formats, and the program benefits from the fact that it is available for just about every platform imaginable. The interface is not the most pleasant to look at, and even if you opt to use the Explorer context menu to create or extract archives, beginners may well feel overwhelmed by the number of options and settings on display. That said, there is a wizard mode that take the hard work out of most tasks. WinRAR's killer feature is undoubtedly full RAR support, but its encryption, speed, self-extracting archive creation and themes (if you're into that sort of thing!) mean it's well worth taking a look at the trial version to see if this is the compression tool for you. Another free compression program, PeaZip (for Windows and Linux) is simple looking but surprisingly powerful. In addition to regular compression and decompression options, you can also use PeaZip to convert archives between formats. 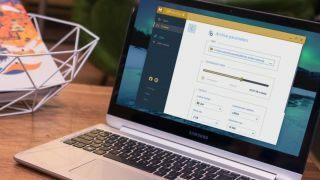 For the security conscious, this file compression software also offers AES256-based encryption and two-factor authentication, as well as a password manager. As with the other compression tools in this roundup, you can make use of the main program interface, or fall back in love with the right mouse button and use the context menu. PeaZip is one compression tool that can, sort of, create – as well as extract – RAR files. If you have WinRAR installed (be it the full version or the trial) PeaZip can make use of the software to gain full RAR support. Although no warning message will be displayed, you're not really supposed to use WinRAR after the end of the trial period, either on its own or through PeaZip. The final free option in this roundup, 7-Zip is another program with an excellent reputation. It can handle pretty much any compressed file format you care to throw at it. A real stalwart of the compression world, 7-Zip boasts its own compressed file format, 7z. This not only lets you compress truly gigantic files (up to 16 billion gigabytes, according to its developers), but also has an incredibly high compression rate. However, this does mean making speed sacrifices; 7z can use 'solid compression' to achieve tiny file sizes, but it can be very, very slow. 7-Zip's interface is far from attractive, and the number of context menu entries the program creates can be a little unnerving. Thankfully, if you venture into Options within the program, you'll find that it's easy enough to get rid of the options you don't need. The look of this file compression software won't be to everyone's taste, but if you can get past this, you have a rock-steady and reliable utility on your hands.